Stainless steel is considered to be the most exclusive and most tensile quality materials which is used for the fabrication purposes of a wide range of products. We are now also availing our clients one of the most excellent quality stainless steel railing fabrications. These railing fabrications are used for making attractive and attractive staircase boundaries and railings with it. 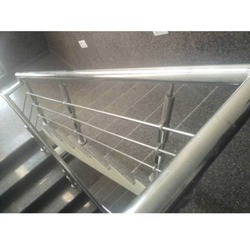 These S.S. railing fabrications are brilliant in their looks and very attractive and shinning. Incorporated in the year 1990, we RG Steel Corporation are reckoned organization in the market, highly engrossed in manufacturing, supplying, trading, exporting, wholesaling, retailing and service providing a broad array of products. Our offered range is consists of Fabricated Gate, Fabricated Railing, Pipe and Tube, Rod and Angle, Metal Sheet, Hardware Fitting, Prefabricated Portable Structure, Spare Part, Industrial Rack, Metal Furniture, Wire Mesh and Building Grating. These products are highly recommended and appreciated in the market for their durability, fine finish, corrosion resistance, abrasion resistance and high strength. Under these categories we offer MS Gate, SS Gate, Fabricated MS Gate, Fabricated Fancy Gate, Fabricated Metal Gate, SS Fancy Gate, SS Front Gate, Fabricated Wooden Railing, SS Wooden Railing, SS Tube, Metal Pipe and MS Pipe. Our offered range is manufactured at our manufacturing unit by making use of high grade raw material and progressive technology in accordance with international quality norms and principles. We also provide industrial metal fabrication services to our clients. The components which we use to fabricate these products are procured from the most trustworthy and authentic vendor of the industry. In addition to this, we also provide customization facility to our customers’ as per their demands and needs at very economical prices.